If you are a non EU national and you have requested a visa for entering Italy you have to apply within 8 working days from your arrival either for a declaration of presence or for a stay permit depending on the length of your stay. If you are staying in Italy more than 8 working days but no longer than 90 days, you have to make a Declaration of presence to the Immigration office within 8 working days from your entrance in the Schengen Area. housing contract on your name (or owner's consent declaration if you are hosted by relatives/friends - see Download box). Questura di Trento, Viale Verona 187 (opening times from Monday to Friday, from 8:30 to 12:30 and Thursday afternoon from 15:15 to 17:45), if you live in Trento. Police Station, Via Sighele 1 (opening times from Monday to Friday, from 8:30 to 12:30 and Thursday afternoon from 15:00 to 17:30), if you live in Rovereto. If you have a valid type D visa for study reasons you have to mandatorily submit your stay permit application within 8 working days from your arrival in Italy or in any other Schengen country. The International Mobility Office will support you in every step of your first application that you can find explained below. Please notice: do not close the envelope! You must personally hand in the open envelope to one of the authorized Post Offices (see list in the Download box). pay post charge of 31.50 euros so that your kit can be sent to the Immigration office (Questura). an appointment letter with day and time when you must be at the Immigration office for the stay permit application. Please notice: keep the receipts in a safe place! You will need them to pick up the stay permit when ready! Please attend the mandatory appointment with the Immigration Office (Questura) indicated in the appointment letter received at the Post Office. Before going to the Questura make a copy of all the documents mentioned below. In order to get a stay permit with the same duration of your stay (if you are an exchange student) or for 12 months (if you are a degree-seeking student), make sure all the above documents are also valid for the whole duration of your stay (or alternatively one year). The Questura will however decide the duration of your stay permit. Once the stay permit is issued, no change of any kind is possible. In case your stay permit is shorter than your study period, you will have to apply for a renewal. Please check on the Questura's web site if your stay permit is ready by entering the number (“numero pratica”) you will find on the receipt given you by the Questura at the appointment. 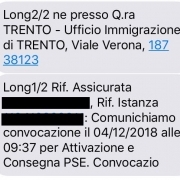 If you had written your Italian mobile phone number on the application form, you should receive a text (see below how it looks like) when your stay permit is ready. However please check online to be on the safe side. Translation: "Please go on DD/MM/YYYY at hh:mm to collect the stay permit at the Immigration Office"
When your stay permit is ready, go back to Immigration Office (desk 6 in Trento) during their opening hours, with: your passport, all the postal receipts and the receipt issued by the Questura. Before leaving the Immigration Office, carefully check all your details and the stay permit expiry date. If something is wrong, immediately report it to the Immigration Office staff. Complaints are accepted only immediately before collecting the stay permit. You can travel to the other Schengen Countries for up to three months in any six-month period while your MULTY-ENTRY visa is still valid, even if you have not received the Italian stay permit yet. This opportunity only applies to the countries that are part of the Schengen Area. Check carefully which countries belong to the Schengen Area, and which don't. Please notice that the Integration Agreement of course does not exempt students from taking any language test required by UniTrento. Renewal application must be posted before the expiry date of the permit. In order to always have a valid stay permit, we suggest you apply for the renewal 3 months before the expiry date. Please make sure you do not leave the country without having applied for the renewal, since you will not be able to re-enter Italy. Please consider that the maximum validity for each stay permit for study reasons is 12 months, provided that all the requirements are fulfilled. The stay permit can be renewed up to 3 years beyond the standard length of the study course. If you are enrolled in a PhD programme, the stay permit can be renewed for a maximum of 1 year beyond the length of the course. a copy of the foreign stay permit or declaration of presence that proves your regular stay in the host country. If you are abroad and come to Trento just for the appointment, plan to stay at least 3 working days so that any problems can be discussed with your referent at UniTrento and Questura before you leave. A stay permit for study reasons can be converted into a work permit as long as it remains within the rates ("quotas") set by the Government every year. If you have an Italian degree (bachelor-laurea triennale, master’s degree course-magistrale, PhD, Master I or II level), and all the requirements are fulfilled, the stay permit for study reasons can be converted into a work permit despite the quotas of the current year. You have 2 months' time after the expiry of the study stay permit to apply for the authorization ("nulla osta") to the conversion. Please notice that a work permit cannot be converted back to a study permit. For further details about the conversion from study into work permit please ask directly information to Cinformi. If you have an Italian degree (bachelor-laurea triennale, master’s degree course-laurea magistrale, PhD, Master II level), you can convert your student permit into a "searching for a job" 12 months permit (permesso per "attesa occupazione") provided that you have sufficient certified financial means. For information and assistance on work permits or on searching for a job permits please ask Cinformi. the expired/going to expire stay permit. Be aware that there is no short-term stay permit which allows you to cross Schengen countries while renewing the permit. circulate within the Schengen area up to a maximum of 90 days every six months as a tourist. After 3 working days you should however report to the competent Public Security Authority abroad. In this case make sure the border police make an exit stamp both on your passport and on the postal receipts. Transits in non-Schengen areas are allowed but always check beforehand whether a transit visa is required by the non-Schengen country. To do so you can contact the foreign competent diplomatic Representation in Italy. You are not allowed to leave Italy for longer than 6 months. If you plan any trips outside the Schengen area while your stay permit is valid you are advised to contact the foreign diplomatic representation in Italy in order to get the necessary information for the entry visa. Usually, beside health insurance coverage, return ticket and economic and housing guarantees, a valid Italian stay permit is necessary in order to apply for a visa. If you are an international student at UniTrento with a study stay permit and you want to join an exchange moblity program, please read carefully the information about the renewal application in the previous paragraph and contact for further information the International Mobility Office. A stay permit for study purposes allows to work for a maximum of 1040 hours per year with a contract as an employee, in Italian "lavoro subordinato”. Working contracts defined as "lavoro subordinato" are the following: dipendente, somministrazione, apprendistato, contratto di lavoro ripartito, contratto di lavoro intermittente, lavoro accessorio. Students are allowed to work full time for a few months or part-time for the whole year, provided that the job does not imply more than 1040 hours/year. Also 150 hour students collaborations are possible with this kind of stay permit.